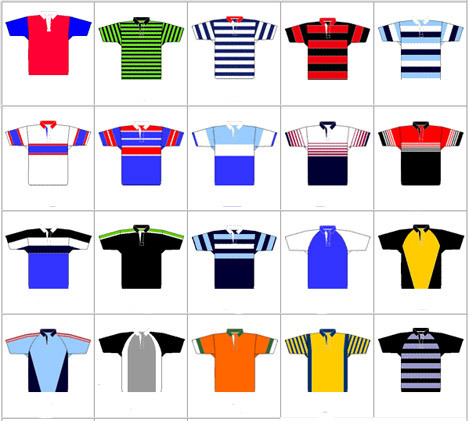 Design your own rugby shirts in a traditional jersey knit or a sublimation shirt. Choose a design from the shirt examples or send a picture of a design of your choice. Spiral specialises in a one stop shop for the Club shops, players and supporters. We use leading brand names including Canterbury of New Zealand. See embroidery and printing for personalised branding options. Traditional rugby shirts are available in three different fits with a choice of sleeves, collar, neck and design. They are made by impregnating (fusing) the colours of the design into the fabric at high temperature. 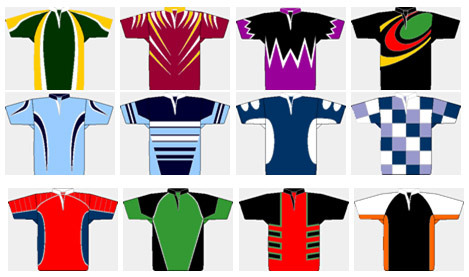 This allows us to create almost any design for your rugby club jersey, which is wash fast. 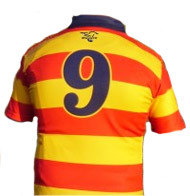 We can if required, produce the Fusion sublimated rugby shirts as hooped designs, so a club can keep the traditional look of their rugby team jerseys. Incorporated into your Sublimation custom shirts, rugby kit design, are all the numbers, club badges and sponsors logos you may require, because this is done at high temperature means that all your rugby gear is wash fast. Available in White, black, red, royal, gold, navy, bottle, emerald, purple, grey, burgundy and chocolate. Can be attached instead of the normal white back neck tape, or substituted for the placket tape. Available in white, black, red, royal, gold, navy and bottle. Number, Colours sewn direct to shirt. Black, white, red, navy, royal, gold, emerald, bottle. (Others may be available). Heatseal colours direct to shirt. Black, white, red, navy, gold, or bottle. 100% Nylon or with a Cotton/Nylon foot. White, Black, Red, Royal, Emerald, Navy, Sky, Lemon, Maroon, Purple, Bottle, Amber, Tangerine, Chocolate, Old Gold, Grey, Pink. 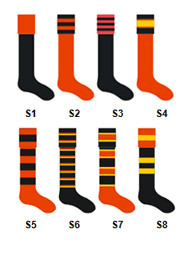 Plain Standard socks are stocked in: White, Black, Red, Royal, Emerald, Navy, Sky, Maroon, Bottle, Gold. (Stock Colours) 6 per colour per size. Hoops, contrast turnovers etc. can be manufactured in virtually any design in up to 4 colours per sock if the sock is 100% nylon and up to 3 colours if it has a cotton/nylon foot. Customers are asked to accept any extra socks made during production. 24 per size and design however the price reduces for orders over 5 doz per size and design. Available with logos, lettering or plain. Elastic at top, ankle and mid foot for greater comfort; a highly technical sock. Plain Stock Colours: 12 prs. First order set up charge applies to bespoke designs.